One of the things parents and teachers consistently say makes Abeona special is community. There are many ways we build community at Abeona House, from our laid-back potluck events to our teachers coming over to babysit. So far my favorite community builder has been our Community Work Days. Community Work Days happen a couple of times a year at Abeona House. On these days, parents come to volunteer their help around campus. Last Saturday we had a wonderful turnout of about 30 parents. Together they painted the playground fence, pruned and planted in the garden, built two new sandboxes, hung curtains, and did other odd jobs. There were even volunteers devoted to watching the younger kids. Several times throughout the day, volunteers remarked that many hands really do make light work. It was incredible how quickly those garden beds were weeded and that fence got painted! I couldn’t be more excited about all the work we got done! I’m excited to show off our garden during the next prospective parent tour. I’m excited to see kids playing in the sandboxes. I’m especially excited to show off the lock on the (already out-of-reach) first-aid cabinet to the preschool licensing inspector! But the benefit of Community Work Day goes beyond the work that gets done. Perhaps there’s no better way to get to know someone than to work on something together that gets the sweat flowing. It’s no wonder that families feel a sense of belonging at Abeona House. It’s truly a team effort that makes us shine. Each year in August, Abeona House closes for a week of professional development. What do we do all week? Read on to find out. This year we kicked off the week with three hours of medicine administration training. “Nurse Nikki” (aka Nikki Greenaway, certified family nurse practitioner and child care health consultant) taught us about the 8 Rs (right dose, right child, right documentation, etc.) She also answered some of our burning questions about everything from the best way to sanitize a changing table to whether or not to exclude children diagnosed with hand, foot and mouth. By the way, Nurse Nikki offers prenatal, postpartum, and breastfeeding consultations and classes, and I cannot recommend her enough. On Tuesday yours truly gave a crash course in the Reggio Emilia approach. 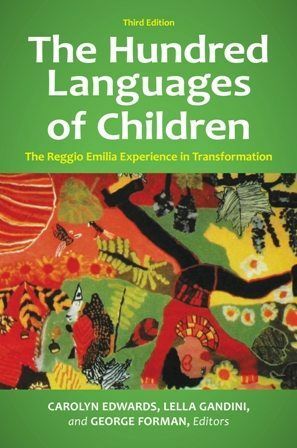 We talked about what characterizes Reggio and walked through several project examples from The Hundred Languages of Children and my own experience. Throughout the week, the staff spent lots of time working in their classrooms. In addition to preparing cubby tags, welcome letters, and wish list trees, the staff spent time rearranging and deep cleaning. 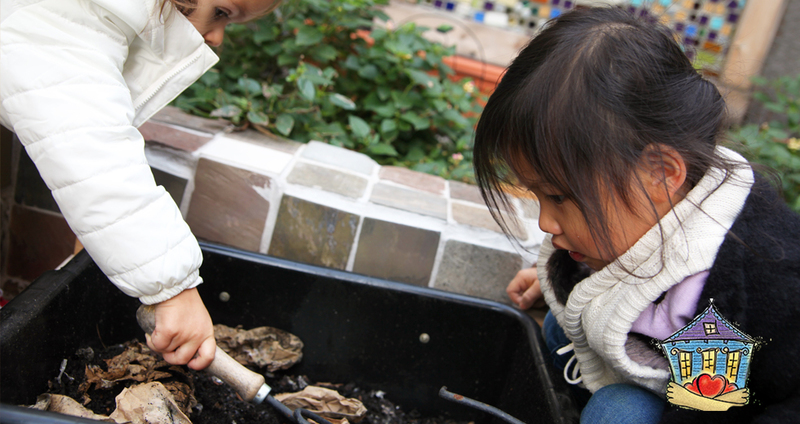 In the Reggio approach, the environment is often referred to as “the third teacher” because we know that children learn from their hands-on experiences with things in the environment. We strive to have classrooms that are soothing, invite new ways of using materials, and promote smooth transitions between activities. We also really appreciate having the time to clean all the dust bunnies out from under the cubbies! On Wednesday we were joined by Sharon M. Gancarz-Davies, LCSW, BACS-a Senior Early Childhood Mental Health Consultant at Children’s Bureau of New Orleans. Ms. Gancarz-Davies facilitated a conversation about children and touch. We talked about things like how to respect children’s personal space and privacy while still getting all the diapers changed, how to teach children to respect each other’s bodies, and how our beliefs around things like respect, inclusion, choice, and self-empowerment affect how we approach these topics. On Friday we rounded out our training with a visit from Ms. Jackie Rodriguez, a trainer from Agenda for Children, a non-profit advocacy and service organization that focuses on the well-being of children. Ms. Jackie gave us an overview of the developmental phases of early childhood and talked about the importance of recording our classroom observations and using them to guide our student assessments and lesson plans. The week flew by, and before we knew it, we were welcoming our new students into our classrooms. Our next professional development will be at the end of the month (after school) when Emmy O’Dwyer, the founding director of Abeona House, will talk about classroom management the Abeona way. We’re grateful for these opportunities to expand our knowledge on the important and complex task of caring for young children. Everything is well on the food program front. We’ve been trying new sides – kale chips! cucumber salad! – and enjoying our old favorites, too. This month, though, I thought I’d take a break from sharing about the food itself to discuss another favorite topic at Abeona House: community building. Food brings people together. It allows us to learn about each other, to share our preferences, our traditions, and our passions. I’ve learned that Akira in the Fish Cove loves tofu and eats it at home with his family. In the Garden room, Evelyn will always ask for seconds on beans and Nicholas informed me that his dad taught him to identify sweet potatoes. I also have the privilege of learning about our broader community through food, when folks working at First Grace stop through the kitchen. Ms. Stephanie tells me about how her mom could feed their big family delicious Southern food on a budget, and Jacinto (father to Sebastian in the Beehive) offered a yummy taste of his mom’s bread from Mexico. And food gives us time and space to relax with one another. I love the conversations we have over mealtimes at Abeona, even when they are not about the meal we are eating. The time gives us an opportunity to reflect on our day and share new ideas. Earlier this week, Miss Caitlin invited me to join the Garden for a lunch discussion on feminism. Rock on, preschool! What are your family’s food traditions? What do you discuss over the dinner table? The Abeona House food program was instituted using the farm-to-table model, incorporating local, fresh, and organic foods into the meal plan wherever possible. Following in these footsteps—and excited to see how we can expand our vision—the Abeona House community will take on a food program inspired by the movement for Food Justice. So, for my first blog post (!!! ), I’ll introduce this idea. Building a food program around Food Justice means that we see the benefits of eating healthy, organic, good-for-the-earth meals to the same degree that we value the people involved in every stage of producing our food. It means understanding our food as part of a massive system of production that often hurts marginalized communities, but has the potential to benefit all people and landscapes. It is a movement built by migrant workers underpaid, overworked, and exposed to chemicals in farming fields; it is a movement built by Black and brown communities surviving in spite of neighborhoods lacking basic grocery stores; it is a movement built by guerilla gardeners. How will Abeona House lift up this movement? Through food buying. We won’t be able to replace everything we purchase with foods that we believe are humanely raised and sustainable. Because our current food system is not built around justice, it is too expensive. What we can do is replace specific foods (i.e. food that has been historically produced under poor conditions, food that is particularly high in chemicals when not raised organically) and use those as points of learning for our community. We can also seek out local growers we want to support and use the produce grown in our very own garden. Through education. Making a dent on our food system will take big work and garnering the strength of many communities. Our work is to grow a new crop of youngsters who like their meals and appreciate how they got to them. In the coming weeks, look out for more blogposts on what we’ve been eating and learning. We are very excited this week to be finally putting in our new school garden! Working with professional gardener Susie Wrenn, whose work you can see at Atchafalaya Restaurant (among others), we hope to have a beautiful and diverse garden. Our vision is to have vegetables, flowers, and even fruit trees that our students can explore and learn from. Our harvest can even add teachable moments during lunch time, by bringing to light the cycle of our food from the ground to the plate. We eat a lot of eggs at Abeona House, it’s no joke. They’re full of protein, easy on a budget, and kids love them (unless you have an egg allergy, then you’ll probably have toast and sunbutter that day). To feed around fifty 1-4 year olds takes 39 eggs according to the USDA. That takes some time! So this week, I just want everyone out there to know I mastered a one-handed egg break flawlessly, and when my other hand was looking for something to do, I mastered two eggs at once! No big whoop. If you’re looking for a new challenge in the kitchen and want to impress your kids and friends by looking super cool, give it a try (and make sure you check for shells the first few times). Friday September 5th was National Cheese Pizza Day! In accidental celebration, we feasted on delicious cheese pizza on our homemade sourdough crust. The dough is started from a little chunk saved from the last batch, and takes 3 days to finish. The original sourdough was made in France many years ago using rotting fruits and vegetables to ferment a mixture of flour and water. It’s a pretty amazing process when I think about it, and by far our favorite lunch at Abeona House. Sometimes a picky eater can be a daunting task for caregivers. One day, feeling a little defeated, I cried to Julie, “If only we could give an M&M reward when they try everything on their plate!” Rewards and incentives subsequently became one of our topics of conversation during Professional Development. We discussed how rewards for desired behaviors can create a negative relationship with the child and food. Instead of a reward, we want to encourage “thank-you bites,” where we show an appreciation for the process and care put into our food. Good eating habits are something that parents and caregivers should encourage but never force.